Preheat oven to 350°F. Grease and line 2 8″ pans, 2 7′ pans, 2 6″ pans, and 2 4″ pans. Mix chunks of room-temperature butter slowly into the dry mix, on a low speed. Continue to mix until no large chunks of butter remain, and the mixture becomes crumbly. Pour in egg whites, and mix on low until just incorporated. Mix in the buttermilk in two installments, on a low speed. Add in vanilla and oil, and mix at a low speed until fully incorporated. Scrape down the sides of the bowl with a spatula, then beat on medium high for about 30 seconds. Evenly divide that batter between three bowls, and color one light blue, one a light purple, and one light green. If you don’t have cake pans in those sizes, you can always make extra batter, and trim more cake away to get to the desired shape. For example, you could bake four 7 inch cake layers for the top of the cake, and trim away the top more. Bake cake layers for 25-40 minutes, or until a skewer comes out clean. My 4 inch cake pans baked in about 25 minutes, and my 6 inch and 7 inch cake layers baked in about 36 minutes, and my 8 inch cake layer baked for about 35 minutes. it all comes down to how much batter you place into each pan. Try to make each layer the same height, to ensure uniform layers for stacking. Allow cake layers to cool for 10 minutes, then run an offset spatula around perimeter of the pan to separate the cake from the pan. Place cake layers on a rack to finish cooling, and then chill in the freezer until firm to the touch (at least one hour). This will make it easier to carve them. While the cakes cool, prepare the frosting! Beat the butter on high for 30 seconds, until smooth. Slowly add in the powdered sugar, 1 cup at a time. Alternate with small splashes of cream. Once fully mixed, add in the vanilla and salt, and beat on medium low until the ingredients are fully incorporated, and the desired consistency is reached. If the frosting is too thick, add in cream (1 teaspoon at a time). If the frosting is too thin, add in more powdered sugar (quarter of a cup at a time). You can see a full tutorial on how to make this frosting here. Assemble the cake layers largest to smallest, to build a cylindrical pyramid. Apply a thin layer of frosting between each layer with an offset spatula. 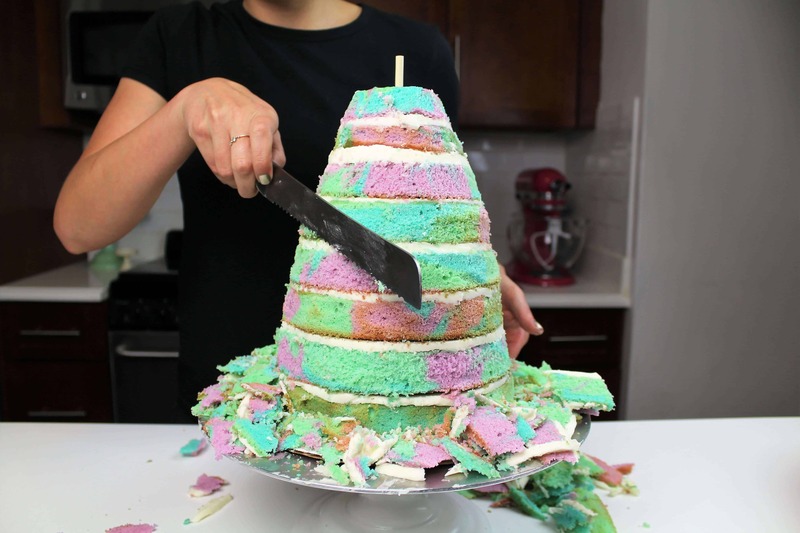 Once all the cake layers are stacked, insert a tall wooden dowel into the cake layers. Place cake in freezer for about 5 minutes, to allow the cake to firm. Using a serrated knife, trim cake layers into the shape of a tail. Apply a crumb coat of white frosting, and then chill the cake in the freezer for another five minutes. Once the crumb coat is firm to the touch, color the remaining frosting a light shade of turquoise. Apply a second layer of frosting, and smooth with a flexible smoother (bowl scraper or acetate sheet). Twist together the colored fondants, and mix in tylose powder. This will help the thick tail to dry more quickly. Make the tail the night before, to allow it to fully harden before adding to the cake. Once the fondants have been twisted together, roll out to about 1/3″ thickness, to create a marbled effect. Use a pastry cutter to trim into the shape of a tail, then insert wooden skewers into the tail. 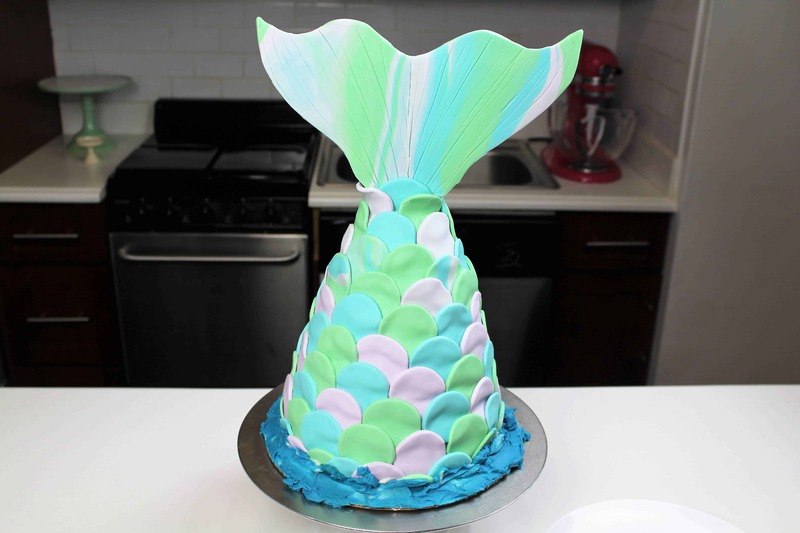 Use remaining fondant to make the scales. Use a 1.5 inch circle cookie cutter, and cut out several circles from all three colors of fondant. Once the tail is firm, insert it on top of the cake. Cover the cake in the circle scales, alternating all three colors, and working from top to bottom. 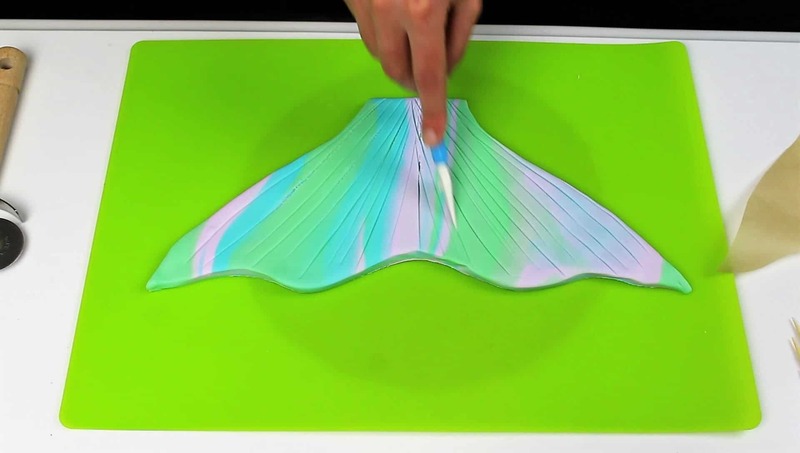 Spread some blue fondant around the base, to look like waves. How much fondant of each color did you use? I think about a half a point of each color! Slightly more for the color you make the tail from! Do you know how much that is in grams? I‘m from Europe and couldn’t find an equivalent. Would you share the link for your turntable? I just started learning and the one I’m using isn’t that great! Have you used the turntable with the plastic base? The cast iron one is pretty expensive. I believe wilton makes a plastic one, and it works ok but is no where near as good as the metal ones! If you dont bake much, a plastic turntable will do. however, if you do bake a lot, the metal one is worth it! Mine is an Ateco, and I’ve had it for years! 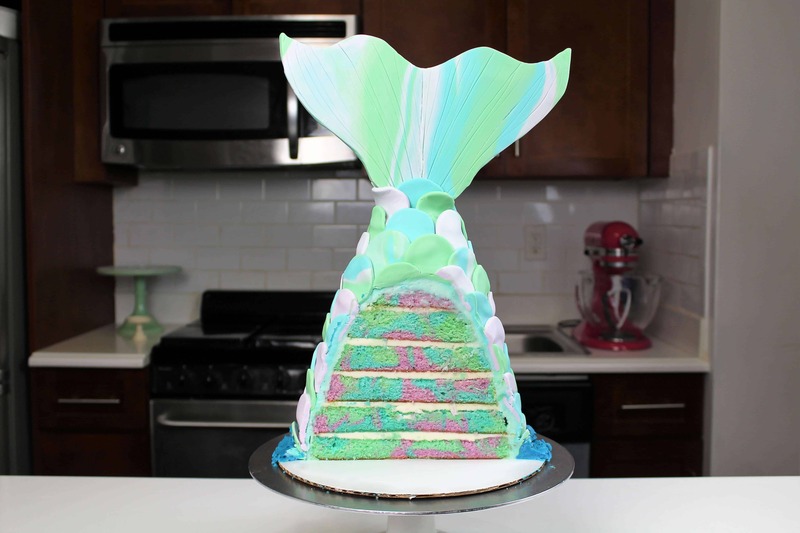 Hi Chelsea – if I want to assemble this cake the night before a morning birthday party, can I gently Saran Wrap the scales and store it in the fridge overnight? And then add the fin in the morning? Thanks! fondant in the fridge can be a bit scary, because it can get condensation on it as it thaws, creating a goopy mess!! I recommend adding the fondant details all the day off! !